The role of geographical distance in candidate evaluations by voters and subsequent vote choice remains one of psephology’s relatively untested hypotheses. Theories of representation would suggest that, in systems where constituency representatives vie for local inhabitants’ support in elections, candidates living closer to a voter should have a greater probability of receiving that individual’s support, other things being equal. Yet, to date there have only been qualitative or inferential, indirect tests of this hypothesis in the UK, and relatively little research on other countries. This has principally been due to insufficient data to allow the measuring of distance from voter to candidate in any meaningful manner. Advances in open source geographical data and Geographical Information Systems (GIS) software, together with publicly available election data, mean that such hypotheses are now more easily testable. In this paper, we present a first empirical analysis using constituency data from the British General Election of 2010 and the British Election Survey (BES), together with geographical data from Ordnance Survey, to test the hypothesis that candidate distance matters in voters’ choice of candidate. We map constituency residence of Parliamentary candidates and where possible calculate a distance measure to voters sampled by BES living in their constituency. We find that, in English constituencies, distance between a voter and candidates from the three main parties (Conservative, Labour and Liberal-Democrat) does matter, even when controlling for traditional predictors of voting, such as party feeling and incumbency advantage. This suggests that candidates living closer to their voters enjoy a small but significant electoral advantage over rivals living further afield, and provides further confirmation of previous research which has found that the localism of a candidate matters to voters. Why should the relative distance of candidates to voters in a constituency matter? There is very little work specifically testing this hypothesis, and in the UK case, none of it does so directly. We build upon an existing body of research which suggests that a candidate who is more proximate to the constituency, and by extension its voters, will enjoy characteristics which will resonate positively with those voters and which, other things being equal, suggest more effective representation for that constituency. Broader tests of localism are more common. Johnston’s work on New Zealand local elections found limited evidence of a local effect (1973a: 422) but again surmises that at national elections, “[v]oters are unlikely to cross party lines to support a local candidate” (420). Hypothetical mapping of the distance effect through residential and work location states most clearly a candidate-oriented methodological perspective (Johnston, 1973b: 75). Cox’s seminal work on spatial effects included study of distance effects, such as centre-suburban location of London constituencies (1968), but investigation of his influential concept of “neighbourhood effect” has been more prevalent in the UK, with different studies concluding that social interaction as an effect does not have a significant impact (Curtice, 1995) or precisely that conversations with family and friends will influence individuals as to how they should vote (Pattie and Johnston, 2000). This follows the extensive literature on peer socialisation, opinion leaders and group interests from Lazarsfeld et al’s work onwards (1948, 1954). Ecological models of vote looking for evidence of distance decay similar to Cox’s neighbourhood effect have been carried out on the American case, in particular testing ‘home state advantage’ (Lewis-Beck and Rice, 1983; Garand, 1988). This builds on Key’s assertion that candidates for state office will do much better in their home counties (Key, 1949). Lewis-Beck and Rice’s work finds that presidential candidates will win a premium beyond their expected vote in their home state, not enormous but sufficient to matter in a close race (1983: 551). They also find that three other key variables mediate this effect – size of state, with smaller states providing opportunity for greater levels of contact, peer networks and knowledge of the candidates; the party affiliation of the candidate, to allow for differential turnout between Democrats and Republicans; and an incumbency effect, with incumbents securing higher turnouts. Garand’s test is more mixed in its outcome, finding evidence of home-state but not of regional advantage (1988: 96), with Democrat candidates seeming to do worse in their home region (1988: 101). Rice and Macht (1987a) consider whether this advantage accrues from otherwise non-voters being mobilised by the local candidate, or by vote-switchers choosing the local against their normal party loyalty, and find that both play their part. Home-stage advantage is sufficiently well established to be used in forecasting models of US presidential elections to factor in the local premium candidates receive (Rosenstone, 1983; Campbell, 1992). Also in the US, Gimpel et al (2008) look at the distance between gubernatorial candidates’ hometowns and other counties in the State, hypothesising that there is a non-linear relationship between distance and trust, and thus to vote, and find at the meso level that this relationship does pertain. Previous work, then, has not pursued the UK case as a likely example to show a distance effect at work. However, other related approaches to candidate evaluation and voter perceptions suggests this may be an oversight. Research into the so-called ‘politics of presence’ considers the reasons for voters preferring candidates whose profile matches that of their eventual constituents in terms of being ‘local’ as well as other characteristics (Childs and Cowley, 2011; Evans 2011). Johnson and Rosenblatt show, using the British Social Attitudes Survey and Hansard / Electoral Commission Audit of Political Engagement, that relatively consistently across time, voters have identified localness – being from the local area – as one of the most important attribute for their MP to have (Johnson and Rosenblatt, 2007: 166). Other work extends the notion of locality from the individual to the concept of constituency itself and notions of territorial constituencies (Rehfeld, 2005). A much broader literature looks at the supply side of candidate selection by parties in the UK and beyond (Denver, 1988; Pedersen et al, 2007). Rush has looked at the number of MPs with direct constituency connections – not just living in the constituency, but also place of birth, education, public service and so on – and found that the highest levels are found amongst Labour and Liberal Democrat MPs, with much lower levels amongst Conservatives (Rush, 2001; Rush in Childs and Cowley, 2011: 6). In earlier literature, there is some consideration of candidate residence (Katz, 1980; Crewe, 1985). More recent experimental tests of relative salience of candidate characteristics in voter preference have shown that the attribute ‘local’ has a greater differential effect than age, gender or occupation (Campbell and Cowley, 2012). Research into the ‘personal vote’ provides additional evidence that the localism of a candidate may matter. A candidate who is rooted in the immediate vicinity of his / her voters may be expected to be in a position to carry out eventual constituency service more effectively – public participation is more convenient, surgeries will be less disruptive for the MP, and therefore more productive, during periods away from Westminster, and so on. Largely written off in the past as a marginal activity reaping few rewards in electoral terms, both by politicians and political scientists (Norton and Wood, 1990), an increase in constituency service by MPs saw a revised assessment of its importance in securing a small but significant share of the vote additional to that secured by more standard vote explanations, not least partisanship. Comparative work found evidence of incumbency advantage through ‘constituency attentiveness’ in the British case, although not as strongly as in the US House of Representatives (Cain, Ferejohn and Fiorina, 1984: 115). There is therefore strong evidence that voters prefer local candidates. In that sense, we are interested in measuring empirically varying localness between the voter and the respective candidates, and as a first step most likely a distance measure. The most obvious loci for measuring relative locality between candidate and voter should be residence. Simply put, if localness matters for the reasons outlined above, then ceteris paribus a voter should prefer a candidate who lives closer to them than one who lives at a greater distance. This is intuitively appealing. As Lewis-Beck and Rice noted, a candidate in closer proximity to a voter will be more likely to be known to some degree ‘personally’ to the voter, can be expected to have similar concerns to the voter at local level, and will see the community resonate with them (1983:552). Johnston endorses the latter two of these arguments – “The candidate wins the voter’s support because a local representative is considered desirable, regardless of party, because he would fight for local causes, or because of the voter’s pride in the local boy and his hope for reflected glory.” (1973: 42) – although he steers away from a widespread effect of personal contact with the candidate due to its limited range. Distance itself is a complex affair, but one well explored in physical and human geography. Building upon distance as commonly defined, ie. Euclidean distance between two points, geographers have identified more appropriate measures to be used according to context (Gatrell, 1983: 29). ‘Straight-line distance’ or the ‘as the crow flies’ metric is often replaced by taxi-cab, city-bloc metrics or route metrics – road distance covered, for instance. Distance as measured by time, for example using so-called ‘isochrones’, are fundamental to traffic analysis (Clark, 1977). Economic distance sees cost incurred to cover the space between two locations as a key metric (Lowe and Moryadas, 1975). The psychologically informed metric of ‘cognitive distance’, which taps respondents’ estimates of distance between locations, may differ from travel time and Euclidean distance (Canter and Tagg, 1975; MacEachran, 1980). In our study, all these distance metrics may be relevant for how voters are to be placed relative to their Parliamentary candidates. In social science terms, distance could also be interpreted as indicating a relative position based upon a socio-economic index such as class, relative district wealth or another comparator. The role of social and locational context in determining voting behaviour has been well studied elsewhere, finding voters to be as influenced by their social environment and territorial position as by individual characteristics (e.g. ; Johnston et al, 2001). In the context of voting behaviour, relative indicators would be likely to influence electoral choice: we might expect voters to favour candidates with less socio-economic distance between them, in terms of occupational status, residential area or indeed individual prosperity. To ensure that a geographical measure does not unwittingly tap socio-economic distance, then, it is important to control for this possible covariation. Lastly, returning to more commonly held notions of distance, the ‘true’ measure may not be one based upon a ratio scale, but rather a step-change based upon areas of proximity, e.g. ‘my street’, ‘my ward’, ‘my constituency’, ‘a neighbouring constituency’, ‘my region’, and so on. Empirically, we restrict ourselves here to testing whether simple distance, as an objective proxy for a multiplicity of perceptions of localness, influences the probability of an individual voting for a candidate in an UK general election, other things being equal. Unlike US studies of localism, we do not predicate the distance hypothesis on the strength of local ties that a candidate may have, and the relationship this may have with size of population in the relevant agglomeration (Rice and Macht, 1987b: 450). Of course, local ties will matter, both directly – involvement in the community – and indirectly – perception of ‘localness’ through place of birth, length of residence, and so on. However, such indicators of localness and local involvement are not easily quantified, so we must necessarily leave these to one side. One potential issue is whether voters know where the candidates live. Collecting survey data to enquire whether an individual knows these addresses would be an unsatisfactory method of tapping this information. A simple ‘yes / no’ response to multiple requests re individual candidates in a survey will not yield data for which we can have confidence in its validity. Asking respondents to give an actual address sets the bar unattainably high. From the perspective of first principles, then, we need to assume that, if voters are aware of where candidates live, and this matters to them, this will be reflected in their likelihood of voting for the candidate.1 We do not expect that voters know the distance to each candidate’s residence. Rather, we wish to see if there is evidence that relative distance of candidates influences the party choice of voters to any degree. It is certain at least that all voters have the opportunity to be aware of their candidates’ respective residential locations, as these are printed on all ballot papers. Whether voters recall seeing this information, or consciously use it in their selection is unknown – that the information is freely available to every voter is known. With one specificity of the 2010 General Election, which we will consider below, we therefore potentially have a dataset which gives full information for candidates contesting the election. The analysis uses a range of datasets. To map constituency boundaries across England, the open-source OS OpenData Boundary-Line™ ESRI shapefile is essential. Candidate addresses were collected using the notices of poll published four weeks before the election. All 650 UK constituencies were covered, with notices returned either directly or downloaded from local authority websites. The postcode for each candidate was recorded, where given. It is important here to note that the requirements for statement of residence of the 2010 election were different to previous elections held over the last 140 years, as candidates were not required to record their home address on the notice of poll, and were given the option of stating only their constituency of residence.2 Precise locations of candidate residences were identified using the Code-Point® point data file and GoogleMaps, which provide latitude / longitude coordinates for every GB postcode. Voter-related data were taken from the short-term in-person panel component of the British Election Survey 2010. For reasons detailed below, we model electoral choices for the three main parties in England as self-reported after the election while controlling for pre-campaign feelings. Northern Ireland had to be excluded ab initio due to an absence of the 2010 constituency boundaries in the necessary ESRI format, while Scotland and Wales were excluded due to having different party choice sets, including significant nationalist parties (the Scottish National Party and Plaid Cymru, respectively).The total sample size of the panel component is 1498. Because of the oversampling of the UK’s smaller nations, restricting the sample to English voters excludes about 23 per cent of the panellists, with self-declared non-voters and voters of smaller parties making up roughly 10 per cent of the remainder, leaving us with 887 cases. These cases represent 146 of the 149 English constituencies that were covered by the BES short-term panel. Location of voters is less easily tapped. Whilst we have (almost) complete data for candidates, we need to rely upon survey data to identify the residential location of a small sample of voters. The British Election Study provides the obvious source of data in this regard, but unfortunately – if understandably – it does not provide the full postcode for respondents, only the first letter(s) and digit(s), i.e. the postcode area and district. There are currently roughly 2,900 postcode districts in use in the UK, and almost all of them are far too large to locate voters with any reasonable degree of accuracy. Fortunately, the BES does provide a code for the respondents’ electoral ward or ‘electoral division’ (in the new Unitary Authorities). The Office for National Statistics’s most recent (December 2010 edition) file lists 7,681 English wards, most of which are rather small. Our 887 respondents live in 271 of these wards. Figure 2 indicates the location of these wards within the 146 constituencies. Similarly to Gorecki and Marsh in their study of Irish voting (2012), we then use the centroid – the notional centre of balance of a polygon – of each ward to estimate the location of the voter and consequently calculate, using Google Geocoder API, the route distance between this position and the locations of the relevant candidates to generate a set of distances from a voter to each of their three candidates.4 Using centroids instead of the voters’ exact positions introduces some statistical noise into our model, but we believe that the effects are moderate: 50 per cent of our wards cover an area of 4.4 square kilometres or less, with 75 per cent being smaller than just above 13.5 square kilometres. The distribution is, however, heavily skewed to the right: the top five per cent of the wards cover areas between 60.3 and 95.6 square kilometres. We provide a diagnostic test of this effect later. Other things being equal, the likelihood of an individual voting for a candidate decreases as distance from the individual’s residence to the candidate’s residence increases. To test this robustly, we need to include the distance measure in an appropriate model controlling for other standard explanations of vote. Clearly, a fully specified model of vote along the lines of Michigan is not feasible given the analytical sample size. We therefore choose a basic thermometer of party feeling as our key control, hypothesising that all prior causes of vote are likely to manifest themselves through this pseudo-instrument. We use party feeling from before the campaign, to ensure that this is free from campaign effects, band-wagoning from knowing the outcome of the election and other similar biases. We also expect that, prior to the campaign, knowledge of candidates’ residential whereabouts will be at its lowest, with all voters having similar access to this information only at the stage of balloting.5 We do need to acknowledge that voters may well have received information regarding candidates’ localness, or otherwise, in the so-called ‘long campaign’ leading up to the election, where voters are primed with literature detailing localness prior to the campaign proper concentrating on policy issues. This still relatively understudied phenomenon has been noted in particular for continuous Liberal Democrat campaigning, between general and local elections, for example (Cutts, 2006: 75). Within constituency, we would expect uniform levels of information, but are unable to control easily for cross-constituency variation in information. We return to the implications of this ‘long campaign’ in the discussion. Party feeling covers the majority if not all of the variables squeezed through the funnel of causality. However, given the importance of constituency service to our hypothesis – there may be considerations of effective representation for voters, as well as a sense of shared proximity – we must additionally control for incumbency advantage. If constituency service picks up additional variance beyond the party feeling instrument, this may simply be a function of a sitting MP, irrespective of distance to his / her voters, who has developed a personal vote through such activity. Desposato and Petrocik have shown, through tests using redistricting in the US case, that such an advantage works through constituency service anchoring non-partisan voters, rather than as an automatic ‘bonus’ (2003: 19). We therefore need to control for incumbency to ensure that our distance effect is not confounded by non-distance related anchoring covarying through incumbents living closer to their constituencies. Similarly to the personal vote, past work on incumbency advantage has disagreed on its effect. Despite consistently stronger partisan foundations to vote than in the US, Cain et al (1987) found evidence of Labour incumbency effects, and increasing importance for incumbency generally (although not at US levels). Following from more robust models of incumbency advantage in the US (e.g. Gelman and King, 1990), Katz and King found that incumbency advantage matters differentially for the main parties in the UK, mattering least for the Conservatives, but that there was no evidence of it increasing in importance (1999: 29-30). Fieldhouse and Cutts more recently found, however, that the Labour party ran significantly stronger campaigns in constituencies with incumbent candidates (2009: 382). Gaines, on the other hand, found incumbency advantage in the UK to be strongest for Liberals – a finding supported by Denver et al (1998) – but with little or no effect for Conservatives or Labour (Gaines 1998; see also Ansolabehere and Gerber 1997 for a discussion of incumbency advantage and its effect on minority parties). We condition incumbency effect in two ways. Firstly, we control for personal incumbency advantage. Secondly, we include a party incumbency variable, where incumbent candidates have stood down, to test if there is any residual ‘bonus’ which a party receives from having held the seat in the previous legislature, despite the incumbent standing down. Desposato and Petrocik’s rejection of the notion of an automatic bonus in the US case suggests that this variable will not pick up any variance, but we feel it is worth checking anyway for the UK case. Lastly, we control for socio-economic distance using the English Indices of Deprivation (2010) for voter and candidate location. This composite measure is based on a broad and multi-faceted notion of resources (e.g. adequate access to the job market, housing, education, social conditions etc.) proposed by Townsend in his seminal 1987 paper. While Townsend’s original concept chiefly refers to individual deprivation, it has been usefully applied in small area statistics to capture crucial differences in living conditions between local neighbourhoods. Building on previous work dating back to the 1990s, the Oxford Institute of Social Policy at the Department of Social Policy and Intervention on behalf of the Department for Communities and Local Government has recently updated the Indices of Deprivation for 32,482 Lower layer Super Output Areas (LSOAs). 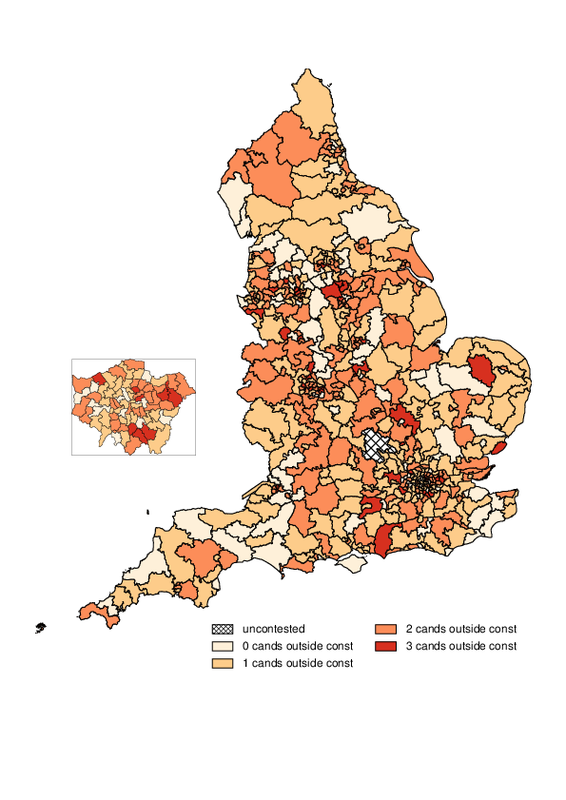 While the actual calculations are complex (McLennan et al., 2011), the measure essentially aggregates objective information on deprivation across seven domains – income, employment, health, education, housing and services, living environment and crime – into a single figure that can be used to assess the degree of deprivation of a given area.6 LSOAs are very small, homogeneous areas that were specifically constructed for census purposes. On average, just 1500 people live within a LSOA. For candidates’ residences, their full postcodes uniquely identify the encompassing LSOAs so that the assignment of a deprivation score is straightforward. Electoral wards very rarely correspond to a single LSOA. Therefore, we calculated averages of those LSOAs with whom a ward overlaps, with weights proportional to the sizes of the overlapping areas. The GeoConvert service provided by MIMAS (http://geoconvert.ds.man.ac.uk/) greatly facilitated these calculations. While many publications focus on the relative rank of a given location (i.e. its place in a league table based on deprivation scores), we look at the differences between voters’ and candidates’ deprivation scores. If voters are selecting candidates on the basis of the similarity in socio-economic status, we would expect there to be a negative association between vote probability and this differential index. Its inclusion is principally to allow for possible covariance between this and geographical distance, consequently we include it in a final step to our model, to see if geographical distance indeed washes out. We model party support including the above variables using a conditional logit model. Unlike more common binomial and multinomial logit models, the conditional logit model (Long, 1997: 178 ) can estimate effects of alternative-specific variables (i.e. distances between a voter and each candidate). Put differently, we estimate a single coefficient for the effect of distance, but the values of this variable differ within subjects (voters) for each category (party choice) of the dependent variable and are potentially different for each voter, depending on their precise location. Using the Labour candidate as the reference, the model will estimate the likelihood of a Conservative or Liberal Democrat vote, with single control estimates for incumbency, party feeling and driving distance, measured in kilometres. We present three nested models, showing the effects of incumbency when added to the model. Table 1 presents the conditional logit model of party distance effect on relative support for the three main parties in England.8 The model includes two constants that capture any differences in the baseline probabilities of voting for the three parties (after controlling for the independent variables). Everything else being equal, a Tory vote is significantly more likely than a vote for Labour, whereas thedifference between the Liberal Democrats and Labour is not significant. As expected, by far the best predictor for party choice is pre-campaign party feeling. Across the 11-point range, the logit increases by 0.8 for every one-point increase. Note that the model is ‘alternative-specific’, so the thermometer effect is the same for all parties, but for each respondent the direction and intensity of each voter’s feelings are obviously likely to differ across parties. Although relatively small, the driving distance effect is significant, and in the expected direction: as distance between voter and candidate increases, so likelihood of vote for that candidate decreases. In Model 2, we include incumbency status as a simple index ranging from -1 (non-incumbent) to +1 (incumbent candidate), with the value of 0 representing party-only incumbency. Even after controlling for pre-campaign party feeling, the effect of incumbency is also significant. This is intuitively appealing, the coefficient reflecting the effects of political learning throughout the local campaign, where incumbent candidates will focus on the experience gained during their previous term(s), and their achievements for their constituencies – in other words, constituency service. Again, incumbency status is an alternative-specific variable, i.e. we treat it as a feature of the candidate that has a uniform positive effect, regardless of the candidate’s party affiliation. If we unpack incumbency status by replacing the index with two separate dummies, as we do in Model 3, it is easy to see that its effect has nothing to do with a party carrying a constituency. Rather, this is a personal (and strong) effect. Moreover (and most importantly for our research question) controlling for personal incumbency advantage does not reduce the importance of distance. Finally, it is clear from Model 4 that geographical distance is not related spuriously to vote probability through socio-economic distance – indeed, the deprivation index shows no effect whatsoever.10 Apparently, this element of vote choice is being picked up in the party thermometer. So far, we have demonstrated that personal incumbency and spatial distance have effects on the vote that are consistent across a range of specifications. Up to now, however, we have made two assumptions regarding the functional forms that might be simplistic: that personal incumbency can be treated as dichotomous, and that distance has a linear impact on the logit. After all, the effect of distance could well level out once a threshold value is passed. Similarly, the effect of parliamentary service could peak after two or three terms and possibly even decline after some turning point where voters grow tired of perpetual incumbents. To test for different functional forms, we first replaced the personal incumbency dummy by a count of each incumbent’s years of continuous parliamentary service. Following the procedure outlined in Royston & Altman (1994), and Royston & Sauerbrei (2008), we then replaced both variables by a series of fractional polynomials and estimated the corresponding models to find each variable’s best-fitting non-linear transformation. However, no transformation significantly improves the model fit, so we retain the original parsimonious specification (Model 4). We perform one final diagnostic test to check for effect of ward size on the model. Because we are unable to identify precisely where a voter lives, the ward centroid provides an estimator which inevitably introduces random error. 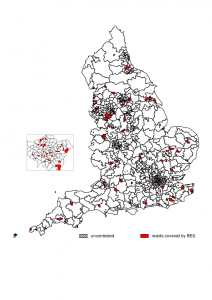 Given that a number of principally rural wards are relatively large, we want to ensure this ‘louder’ statistical noise is not biasing our findings significantly. In Table 2, then, we report a reduced sample model including only those voters who live in wards under 65 square kilometres in area. It is clear from this table that, whilst the largest wards do introduce some bias into the model, this makes no substantive difference to the findings. Given the political colour of the larger, rural wards, unsurprisingly the Conservative baseline loses significance. However, the driving distance parameter increases in size slightly. How, then, do these models translate into ‘quantities of interest’, i.e. wins/losses for the parties? One thing that we should keep in mind here is that we are looking at voters for the three main parties only. Moreover, the sample is certainly biased, because we can only look at English panellists who responded to both pre- and post-election waves, to allow us to measure pre-campaign feeling and actual vote, and we have not applied any weighting. In the end, however, we are not interested in levels of vote, but rather in marginal change. Table 3 provides some simulations of scenarios of three-party competition including candidates based at different distances from the ‘average’ voter. The upper half shows the real distribution of the independent variables, i.e. average feeling for the three parties in the sample, the proportion of respondents for whom the respective candidate/party is the incumbent, average deprivation differential, and the average geographical distance (in km). By and large, candidates are local on average (19-27 km away), and Labour is by far the least popular party. Below the line, the ‘Real’ row shows the expected probabilities of a Conservative/Liberal Democrat/Labour vote, conditional on the distribution of the independent variables. Overall, then, to answer the question posed by Pedersen et al (2007), “Which candidate will – or should – the local leadership prefer – the local resident/native son or the candidate from outside, the parachutist?”, the evidence indicates that parachuting in outsiders is risky, unless the constituency is very safe. We set out to test whether there is evidence that distance between candidates and voters in UK elections influences vote-likelihood. As a first-principles test of geographical distance, there clearly remain a large number of refinements to be made to the model. However, the findings thus far are clear and appealing. Candidate distance does matter, with voters finding distant candidates less appealing than local ones, even when pre-campaign party feeling and personal incumbency effects are controlled for. This confirms the findings of the Gorecki and Marsh test (2012) but overturns others’ notion that this is an Irish finding that would not replicate in a UK setting. Admittedly, the effect is relatively small. In a safe constituency, residency is not game-changing. In a marginal constituency, however, the small distance effect could prove more decisive. Given we have a number of reasons to believe our model is conservative, this also represents the minimum effect of geographical distance. Certainly, as our simulations show, local is better. Of course, local is not always possible. Moreover, candidates cannot live close to all voters, particularly in single-member constituencies, unlike multi-member counterparts where candidates can be located strategically. In that respect, our findings do not represent any transforming ‘How To’ for political parties. What they do indicate, however, is that the thus-far largely speculative evidence for the importance of localism bears out in a relatively stringent empirical test of an important aspect to this localism. Voters do have a sense of who is where, and this influences their vote accordingly. As with research into the personal vote, there is a temptation academically to overlook the small effect of distance. However, as Cain et al noted re the personal vote, “[W]hat is of importance to tenured professors seeking to explain variance, and what is of importance to elected officials seeking to win re-election may not correspond very closely.” (1984: 122). Our model shows that geographical distance does matter to voters. Whilst parties cannot use this information to win constituencies which are otherwise beyond their grasp, ignoring this information in candidate selection, for example, is a certain means of putting a constituency further beyond their grasp. That parties have understood this since the 1960s is clear from Norton and Wood’s work: “The position changed significantly in the 1960s. New Members were increasingly expected by local parties to live in their constituencies […] some would-be candidates failed to secure adoption because they disclaimed knowledge of the locality.” (1990: 197-8). In that sense, our contribution is important because it is the first robust test of the distance hypothesis that does not rely upon voter or MP perceptions, and includes all mainstream candidates, successful or otherwise. Our findings also suggest a paradox in political elite behaviour. On the one hand, the locating of candidates in constituencies, and the importance accorded to knowledge of localness by parties in the ‘long campaign’, demonstrate that party leaderships are aware that such considerations matter to voters. Even if such awareness only results in lip service being paid to candidate presence in the constituency, this still indicates a conviction that not to play the local card may jeopardise their electoral fortunes. Yet, simultaneously, MPs prior to the 2010 election precisely voted to remove the obligatory indication of addresses on the ballot paper. Constituency of residence is still given, providing a level of geographical information, but nevertheless this represents a step in the wrong direction, away from a cognitive link between candidate and voter through awareness of the former’s location within the neighbourhood. The next step in refining the model is to refine the definition of ‘local’. As the research by Childs, Campbell, Cowley and others has shown, voters do gravitate to someone local, but this is not merely tapped by someone’s residence. Place of birth, regional identity and other dimension of localness all matter. Some of these are potentially, if arduously, quantifiable, and may indeed matter more than geographical distance. Distance also needs refining. Other socio-economic differences, beyond those tapped by a deprivation index, may colour voter perceptions of candidates. If addresses do register with voters when they look at the ballot paper, individual streets within wards may matter just as much. Again, such nuances are quantifiable, and indeed work on social delineations and economic geography are common in sociology and human geography, if less developed to date in political science. There is a good deal further work to be done to refine a distance test to check that it belongs in a ‘full model’ of voting. However, that work appears to be worth the candle in the UK cases on the basis of the first cut of the data. Ansolabehere, J. & Gerber, A. (1997). Incumbency advantage and the persistence of legislative majorities. Legislative Studies Quarterly, 22 (2), 161-178. Berelson, B., Lazarsfeld, P. & McPhee, W. (1954). Voting: a Study of Opinion Formation in a Presidential Election. Chicago: University of Chicago Press. Cain, B., Ferejohn, J. & Fiorina, M. (1984). The constituency service basis of the personal vote for U.S. Representatives and British Members of Parliament. American Political Science Review, 78(1), 110-125. Cain, B., Ferejohn, J. & Fiorina, M. (1987). The Personal Vote: Constituency Service and Electoral Independence. Cambridge: Harvard University Press. Campbell, J. (1992). Forecasting the presidential vote in the states. American Journal of Political Science, 36 (2), 386-407. Canter, D. & Tagg, S. (1975). Distance estimation in cities. Environment and Behavior, 7, 59-80. Childs, S. & Cowley, P. (2011). The politics of local presence: is there a case for descriptive representation. Political Studies, 59 (1), 1-19. Clark, J. (1977). Time-distance transformations of transportation networks. Geographical Analysis, 9, 195-205. Cowley, P. and Campbell, R. (2011). Designing the perfect politician: exploring desirable candidate characteristics using hypothetical biographies and survey experiments. Paper presented to Elections, Public Opinions and Parties (EPOP) conference, University of Exeter, 9-11 September. Cox, K. (1968). Suburbia and voting behavior in the London Metropolitan area. Annals of the Association of American Geographers, 58 (1), 111-127. Cox, K. (1971). The spatial components of urban voting response surfaces. Economic Geography, 47 (1), 27-35. Crewe, I. (1985). MPs and their constituents in Britain: how strong are the links? In V. Bogdanor (Ed. ), Representatives of the People? (pp. 44-65). Aldershot: Gower. Curtice, J. (1995). Is talking across the garden fence of political import? In M. Eagles (Ed. ), Spatial and Contextual Models in Political Research (pp. 195-210). London: Taylor and Francis. Cutts, D. (2006). Continuous campaigning and electoral outcomes: the Liberal Democrats in Bath. Political Geography, 25(1), 72-88. Denver, D. (1988). Britain: centralized parties with decentralized selection. In M. Gallagher & M. Marsh (Eds. ), Candidate Selection in Comparative Perspective (pp. 47-71). London: Sage. Denver, D., Hands, G. & Henig, S. (1998). The triumph of targeting? Constituency campaigning in the 1997 general election. In Denver, D., Fisher, L., Cowley, P., and Pattie, C. (Eds. ), British Elections and Parties Review 8: The 1997 General Election (pp. 171–190). London: Frank Cass. Desposato, S. & Petrocik, J. (2003). The variable incumbency advantage: new voters, redistricting, and the personal vote. American Journal of Political Science 47(1), 18-32. Evans, E. (2011). Selecting the right sort: patterns of political recruitment in British by-elections. Parliamentary Affairs, advance access, first published online March 10, 2011 doi:10.1093/pa/gsr004. Fieldhouse, E. & Cutts, D. (2009). The effectiveness of local party campaigns in 2005: combining evidence from campaign spending and agent survey data. British Journal of Political Science, 39 (2), 367-388. Gaines, B. (1998). The impersonal vote? Constituency service and incumbency advantage in British elections, 1950-92. Legislative Studies Quarterly, 23, 167-95. Garand, J. (1988). Localism and regionalism in Presidential elections: is there a home-state or regional advantage? Western Political Quarterly, 41 (1), 85-103. Gatrell, A. (1983). Distance and Space: a Geographical Perspective, Oxford: Clarendon Press. Gelman, A. & King, G. (1990). Estimating incumbency advantage without bias. American Journal of Political Science, 34(4), 1142-1164. Gimpel, J., Karnes, K, McTague, J. & Pearson-Merkowitz, S. (2008). Distance-decay in the political geography of friends-and-neighbors voting. Political Geography, 27 (2), 231-252. Gorecki, M. & Marsh, M. (2012, forthcoming). Not just ‘friends and neighbours’: canvassing, geographic proximity and voter choice. European Journal of Political Research. Johnson, C. & Rosenblatt, G. (2007). Do MPs have the ‘Right Stuff’? Parliamentary Affairs, 60 (1), 164-169. Johnston, R. (1973a). Spatial patterns and influences on voting in multi-candidate elections: the Christchurch City Council election, 1968. Urban Studies, 10 (1), 69-81. Johnston, R. (1973b). Local effects in voting at a local election. Annals of the Association of American Geographers, 64, 418-429. Johnston, R., Pattie, C., Dorling, D., MacAllister, I., Tunstall, H. & Rossiter, D. (2001). Social locations, spatial locations and voting at the 1997 General Election: evaluating the sources of Conservative support. Political Geography, 20, 85-111. Katz, R. S. (1980). A Theory of Parties and Electoral Systems. Baltimore: The Johns Hopkins University Press. Key, V. O. (1949). Southern Politics. New York: Alfred A. Knopf. Lazarsfeld, P., Berelson, B. & Gaudet, H. (1944). The People’s Choice: How the Voter Makes Up His Mind in a Presidential Campaign, New York: Columbia University. Lewis-Beck, M. & Rice, T. (1983). Localism in Presidential Elections: the Home State Advantage. American Journal of Political Science, 27 (3), 548-556. Long, J. S. (1997). Regression Models for Categorical and Limited Dependent Variables, Thousand Oaks (CA): Sage. Lowe, J. & Moryadas, C. (1975). The Geography of Movement. London: Houghton Mifflin. MacEachran, A. (1980). Travel time as the basis of cognitive distance. Professional Geographer, 32, 30-36. McLennan, D., Barnes, H., Noble, M., Davies, J., & Garratt, E. (2011). 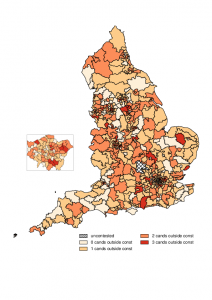 The English Indices of Deprivation 2010, London: Department of Communities and Local Government. Norton, P. & Wood, D. (1990). Constituency service by Members of Parliament: does it contribute to a personal vote? Parliamentary Affairs, 43 (2), 196-208. Parker, A. (1986). Geography and the Irish electoral system. Irish Geography, 19 (1), 1-14. Pattie, C. & Johnston, R. (2000). ‘People who talk together vote together’: an exploration of contextual effects in Great Britain. Annals of the Association of American Geographers, 90 (1), 41-66. Pedersen, M., Kjaer, U. & Eliassen, K. (2007). The geographical dimension of parliamentary recruitment: among native sons and parachutists. In Cotta, M. and Best, H. (Eds. ), Democratic Representation in Europe: Diversity, Change, and Convergence (pp. 160-190). Oxford: Oxford University Press. Putnam, R. (1966). Political attitudes and the local community. American Political Science Review, 60 (3), 640-654. Rallings, C. & Thrasher, M. (2010). The 2010 General Election: aspects of participation and administration. LGC Elections Centre report. University of Plymouth. Rehfeld, A. (2005). The Concept of Constituency. Cambridge: Cambridge University Press. Rice, T. & Macht, A. (1987a). The hometown advantage: mobilization or conversion?. Political Behavior, 9 (3), 257-262. Rice, T. & Macht, A. (1987b). Friends and neighbors voting in statewide general elections. American Journal of Political Science, 31 (2), 448-452. Rosenstone, S. (1983). Forecasting Presidential Elections, New Haven: Yale University Press. Royston, P. & Altman, D.G. (1994). Regression using fractional polynomials of continuous covariates: Parsimonious parametric modelling (with discussion). Applied Statistics 43: 429-467. Royston, P. & Sauerbrei, W. (2008). Multivariable Model-building: A Pragmatic Approach to Regression Analysis Based on Fractional Polynomials for Modelling Continuous Variables. Chister, UK: Wiley. Rush, M. (2001). The Role of the Member of Parliament since 1868, Oxford: Oxford University Press. Studlar, D. T. and McAllister, I. (1996). Constituency activity and representational roles among Australian legislators. The Journal of Politics, 58 (1), 69-90. Townsend, P. (1979). Poverty in the United Kingdom. Harmondsworth: Penguin. Townsend, P. (1987). Deprivation. Journal of Social Policy, 16 (2), 125-146. Thanks to Will Jackson for his work on collecting the notice of poll data, and Eva Frischmann, David Hammann and Paul Ruenz for their work on collecting incumbency data. Thanks also to Philip Cowley, David Denver, Ron Johnston, Charles Pattie, Michael Thrasher and Jonathan Tonge who commented on previous versions of the paper. We also acknowledge the support of the Faculty of Arts, Media and Social Sciences of the University of Salford which provided the pilot-funding to carry out the data collection. 1 This also addresses the issue of candidates who rent properties close to or in the constituency for the duration of the election, and list this as their residence. Assuming such practices occur close to the constituency – candidates would be unlikely to rent at a distance – this will inevitably bias our model, but by rendering it more conservative. If anything, we will underestimate the importance of geographical distance on this basis. Ideally we would be able to control for ‘true’ residence, but the available data do not allow this. 2 Consultation on the publication of candidates’ addresses at UK Parliamentary elections was held at the end of 2008 (Consultation Paper CP(L) 30/08) and a clause added to the Political Parties and Elections Bill in March 2009 allowing candidates to withhold their full address on their nomination paper, and instead identify their residential constituency (SN/PC/05004). A new and confidential ‘home address form’ now accompanies the nomination paper. 3Moran’s I was calculated for contiguity neighbours, with weights scaled so that they sum up to unity for each constituency. The Isle of Wight (which is a Westminster constituency) was excluded, because it has no neighbours. The difference between the Moran statistic and its expected value (-0.002) is statistically significant, but of little substantive interest. 4 As discussed in the theoretical section, there are potentially a number of ways of calculating the distance between two points, the three most common being straight-line distance, route distance and time travelled. We calculated all three for each distance. However, given there was a very high correlation between all three (Pearson’s r > 0.90) we use distance by car, as we believe that this comes closest to the psychological rationale that voters might employ when – if – thinking spatially. 5 Those opting to cast their ballot by post do potentially have much longer to consider ballot-paper information, and indeed to trawl for more candidate information, than a voter going to the polling station. 6 The index gives more weight to Income and Employment Deprivation than to other domains (McLennan et al., 2011, 18). 7This alternative-wise deletion does not necessarily imply that the whole case is lost: If the voter reported a vote for one of the remaining candidates and if information on these alternatives is complete, this choice still contributes to the likelihood function. 8 The n is higher than the number of respondents, because in the alternative-specific perspective, every choice for or against a given candidate is an observation, while the calculation of standard errors reflects the “nesting” of choices within persons. We further correct the standard errors upwards to account for the nesting of voters within constituencies with the same set of candidates. This is roughly equivalent to specifying an even more complex conditional logit multi-level model. 9 While the median distance for incumbents and non-incumbents are almost identical, the proportion of candidates who live far (more than 45 km) away from their (prospective) constituents is roughly three times higher for non-incumbents. 10To protect the privacy of citizens living in sparsely populated areas, deprivation indices are not published for a small number of LSOAs. Therefore, the number of observations is slightly smaller for model 4. This reduction of sample size is less pronounced in table 2, because very large wards contain more of these problematic LSOAs. 11This differential impact is a consequence of the models inherent non-linear structure. Because probabilities are restricted to the unit interval, the negative impact of distance cannot grow without bounds.